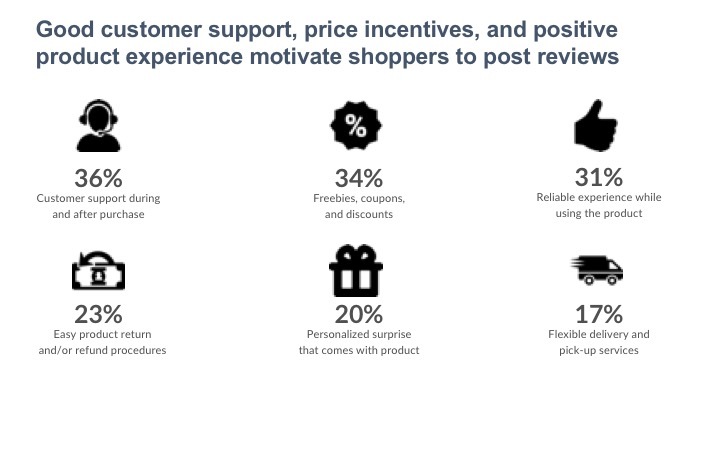 US shoppers are driven by altruistic and well meaning intentions in writing online product reviews. 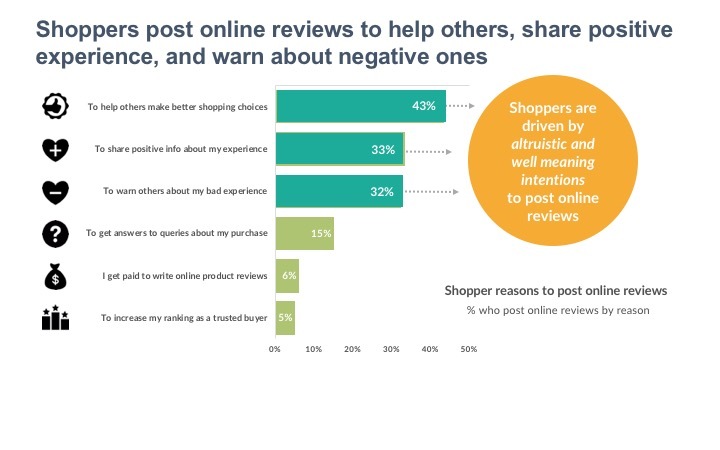 More than two in five (43%) shoppers post online reviews to help other shoppers make better purchase decisions. It is not surprising that shoppers want to help others because it helps them validate their own purchase decision. It also implies that online reviews are more like pop-up communities where people seek interaction around a common theme – the product they want to purchase. In light of this, it makes sense that brands should not only monitor the reviews, but also comments left under reviews as well as Q&A sections where potential buyers post queries and seek help in making an informed purchase decision. 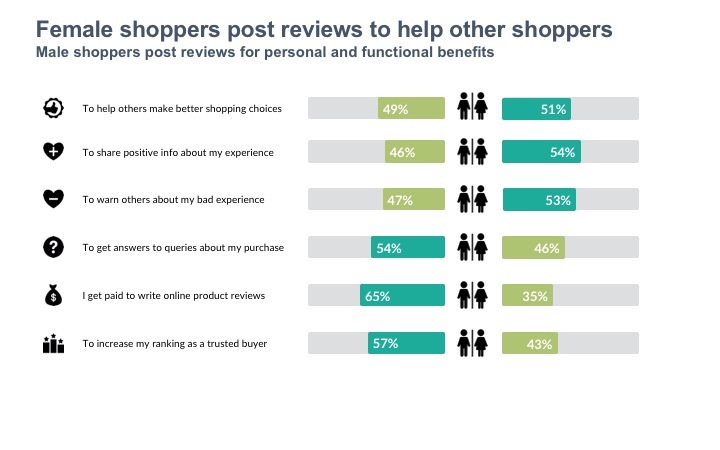 Already 15% of shoppers visit online reviews section to seek answers about purchase related questions. Brands can enhance the shopper experience during the research stage by providing reliable and relevant information to commonly asked questions in an easy to read format such as visually or a step-by-step description broken down into bullet points. Brands can further motivate the reviewer to answer such questions by rewarding them in kind such as appointing them as a trusted member of the community. A small niche (5%) group of reviewers are interested in such trust based online ranking systems. Shopper response to Q&As can become a valuable source of information in developing product manuals and how-to guides that other buyers will find useful upon purchase. Overall, female shoppers are slightly more likely to post reviews for altruistic reasons. 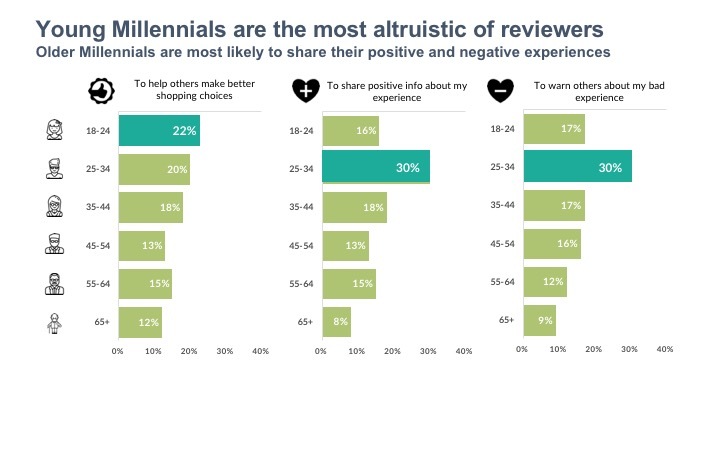 Altruism is also high amongst young shoppers aged 18 to 24 (22%)- the most likely demographic to post reviews to help others make better decisions, followed closely by older millennials aged 25 to 34 (20%). The latter are also most likely to post reviews because they want to either share positive experience (30%) or warn others about a negative one (30%). This does not, however, mean that older shoppers cannot be motivated to post online reviews. The quality of customer support during and after purchase is a key driver for Generation-X and Baby Boomers leaving online product reviews. A third of Generation-X shoppers and more than a quarter (26%) of Boomers say that reliable and helpful customer service motivates them to post online reviews compared to freebies and coupons (21%, 23% respectively). The convenience of a flexible delivery or pick-up service also motivates older shoppers to post online reviews. A third of Generation-X shoppers and three in ten Boomers would post an online review if brands offered such services. In summary, the quality of customer support plays a crucial role in generating online reviews as pointed out by more than a third (36%) of all shoppers. It is vital for an organization’s customer service operations to also track and monitor online reviews so that they can identify any lapses and resolve them before it becomes a larger issue affecting several other shoppers. Monitoring reviews is also key for product development as shoppers tend to post reviews about both positive and negative experience with product usage. More than three in ten (31%) shoppers would post an online review if they were to have a reliable experience while using the product. Product teams can take the positive (and negative) feedback and integrate them to upgrade future products which would lead to positive reviews – a virtuous cycle of customer feedback and product innovation. Finally, while freebies and discounts do influence online review writing, a better way to generate more authentic reviews is by offering complementary services such as easy product returns and refund procedures (23%), personalised surprises (20%), and flexible delivery and pick-up services (17%). Previous PostHow do syndicated reviews affect shopper decision to buy?